apropos of our earlier post. "...Anticipating Richard Hamilton by four years, Hank Williams first uttered the term pop art from the stage of the Grand Old Opry in 1952. Hank could see stretched out before him a future in which art would inextricably entwine with advertising. It was not an unappealing prospect, and Hank embraced it, envisioning museums filled with Brillo boxes and Ken-L-Ration labels and Goodyear Tires winged feet. He had always considered such works on a par with the output of the top European modernists, and all the more engaging because they had been devised by ordinary Americans without pretense, who got their hands dirty and enjoyed the song of the meadowlark at sunset. He could imagine taking that song and fitting lyrics to it that would tell folks about Cities Service gasoline and Wheatena breakfast cereal, things he himself loved, and in return the gasoline people and the cereal people would put his name on a pump and his face on a box. It was all about people helping each other out, and it was also about the clean, uncluttered thrust of American imagery. He never quite understood why it was that when he visited a picture gallery, the paintings of streets never showed the Dr. Pepper signs and the Coppertone billboards and the barns were bereft of their Chew Mail Pouch in big letters. He thought it was a lot like pretending that people never had to go to the bathroom. It was like visiting somebody's house who had made a fortune running burlesque theaters and finding it full of plaster copies of Roman statues..."
Hank Williams didn't really invent the term pop art on the Grand Ole Opry stage in 1952, but it's one of those things that might have happened in an alternate universe. 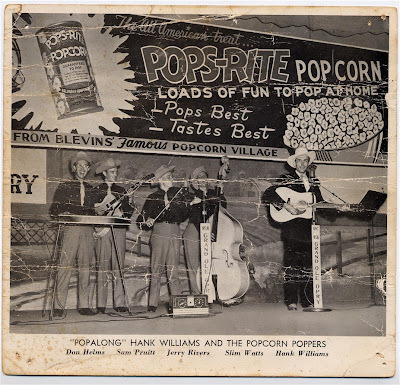 Dreamtime is busy putting together our next podcast - on Hank Williams and his death in the back of a Cadillac on a cold New Year's Day in 19 and 53, and synchronous to our research came across this publicity photo of Hank promoting Pops-Rite Popcorn ("Loads of Fun to Pop at Home"), which was evidently a fulfillment item that Pops-Rite - a Grand Ole Opry Sponsor - sent to listeners. The Blevins Popcorn Co. was founded by James Victor Blevins in 1945. Blevins had been operating a Nashville food brokerage business when he noticed the movie industry boom was boosting sales of popcorn, and signed a contract to supply all the popcorn for a Middle Tennessee movie chain, marketing a hybrid corn that produced better-tasting, fluffier popcorn. Blevins was also instrumental in introducing popcorn to the home market when the movie biz started to slump in the `50s. Blevins named the business' home base "Popcorn Village," as can be seen in the banner behind Williams, and dubbed himself both "Popcorn King" and "Mayor of Popcorn Village." Besides Pops-Rite, Williams' sponsors on his 15-minute morning radio show on WSM included Duckhead Overalls and my personal favorite, Mother's Best Flour. 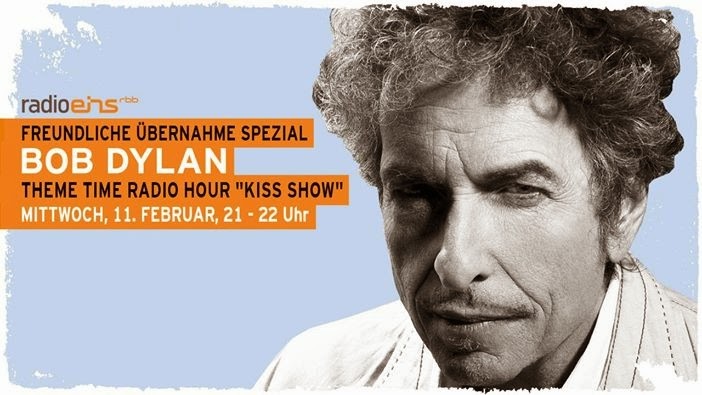 Bet Hank never said, "My music's too sacred, I won't sell pop-corn" either.